Perceptive Pixel knows a thing or two about multitouch technology. And their latest achievement, an 82-inch capacitive multitouch display, comes mere months after unveiling a smaller 27-inch LCD. The 82-inch, optically bonded display doesn't use rear projection or infrared arrays to power its touch technology. In fact, it is the largest screen to make use of capacitive multitouch. The display is only six-inches deep, has a 1920x1080 resolution and makes use of the same projected capacitive (pro-cap) technology that they used in their previous products (and that Apple uses in their products). When asked what some potential uses for a touch screen this big are, Perceptive Pixel founder Jeff Han pointed out some straightforward ones, like classrooms and corporate boardrooms, but he also pointed out some cooler applications, like command rooms for defense agencies. The touchscreens are available for order now through Perceptive Pixel, but they weren't quite ready to publicly reveal the pricing (which is probably some ungodly amount, but also isn't intended for consumers). Han also said that multitouch displays this big will get radically cheaper in the coming years, which should make them more accessible to people like us. Vancouver, British Columbia, and New York – Aug. 9, 2011 – Perceptive Pixel, the leading provider of advanced user interface solutions, today announced the launch of its latest breakthrough product at SIGGRAPH 2011, the premier international conference for computer graphics and interactive techniques. The company unveiled its 82" true multi-touch, projected capacitive (pro-cap) LCD display, the largest optically bonded flat-panel pro-cap display in the world. Featuring a remarkably slim profile, measuring just six inches in depth, the new offering expands Perceptive Pixel's line of professional flat-panel displays, which includes a recently introduced 27" pro-cap desktop display. Perceptive Pixel is changing the way professionals collaborate, communicate and share information, enabling more intuitive interaction with technology in industries as varied as design, government, finance, media and energy. For computer graphics and animation professionals, touch interactivity has opened up new possibilities for how they interact with and showcase their work. Perceptive Pixel's new 82" wall display is ideal for use in creative, collaborative environments such as design reviews, concept pitches, storyboarding and brainstorming sessions, among others. "No other company can deliver the precision and performance of our best-in-class optically bonded pro-cap displays," said David Slobodin, VP hardware engineering at Perceptive Pixel. "Our new 82" multi-touch LCD represents a technological breakthrough that sets a new standard for the display industry." "Multi-touch has become fundamental to the way we interact with technology," said Jeff Han, founder and chief scientist, Perceptive Pixel. "Five years ago here at SIGGRAPH, we introduced the first large-scale true multi-touch display based on rear projection technology. I'm proud to be back at SIGGRAPH 2011 with another industry first – a truly flat-panel 82" display featuring the highly responsive, unlimited multi-touch experience that is the hallmark of our company." Perceptive Pixel will be showcasing its advanced multi-touch solutions in the NVIDIA booth (#453) at SIGGRAPH 2011. 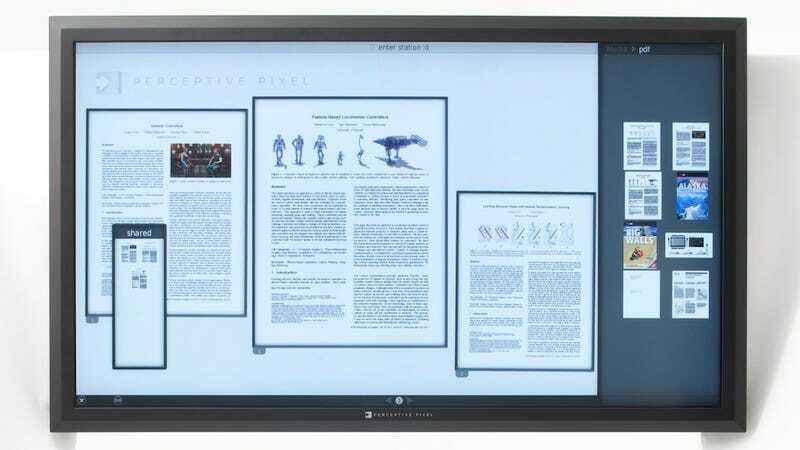 To schedule a demonstration of Perceptive Pixel's new 82" pro-cap display and additional multi-touch offerings, contact Diane Carlson, VP of marketing for Perceptive Pixel. Perceptive Pixel was founded in 2006 by Jeff Han, a recognized leader in the touch technology field, and focuses on the research, development and production of multi-touch interfaces for the knowledge worker. The company's patent-pending technologies enable users to manipulate complex datasets through intuitive, powerful and visually rich interface techniques. The company's products are used in broadcast, defense, energy exploration, geo-intelligence, industrial design and medical imaging. The company's large-screen multi-touch products gained early recognition for transforming the way CNN covered the historic 2008 U.S. presidential elections. Perceptive Pixel was awarded the 2009 National Design Award from the Smithsonian Institution in the inaugural category of interaction design. Perceptive Pixel is privately held and headquartered in New York, with offices in Portland, Oregon; Mountain View, California; and Washington, D.C. For more information, visit www.perceptivepixel.com. Perceptive Pixel and the Perceptive Pixel logo are trademarks of Perceptive Pixel Inc.